On April 22nd, Earth Day will be celebrated across the world. There will be demonstrations, guest speakers in classrooms, and students may be encouraged to have a ‘trash-free day’ or to bring a plant home. While these are worthwhile activities, we can and should do more. We can do more every day. We cannot only care for our environment on Earth Day. For years, Indigenous women have been telling us about the state of our water. They have been warning us about the pollution leaching in by accident and the pollution being dumped in on purpose. They have warned us about disrupting the flow of water across this land. They have been asserting their right to clean drinking water and have been advocating on behalf of more than 100 communities that are still under boil water advisories. Women have a close connection and relationship with water in many Indigenous worldviews and they often take on the role of the caretaker or protector. This is why movements like Idle No More and Mother Earth Water Walk are often spearheaded by women. In her article titled “Aboriginal Women, Water and Health: Reflections from Eleven First Nations, Inuit, and Métis Grandmothers”, Kim Anderson spoke with Grandmothers from different Nations across Turtle Island. Many of the women she spoke with talked about how water can be seen as the life-blood of the Earth. Just as our bodies have veins and arteries which carry blood, the rivers and streams carry water through the land. Most of the Earth’s surface is water, just as our bodies are mostly water. We can form reciprocal relationships with water. The Grandmothers’ Traditional Knowledge tells us that water will take care of us if we take care of it. Water can provide humans with food, hydration, means of transportation, medicine, and other necessities. But water cannot just keep giving without us offering something in return. We need to take care of it, we need to keep it clean, and thank it for helping us. Water is not a resource, it is our sibling. 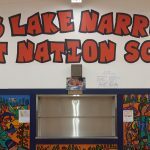 In the following resource, which was created in collaboration with Seven Generations High School, we hear Laura Horton from Manitou Rapids talk about her own journey of advocating for clean water. As Laura tells us, water is not replaceable. Once the water we have is gone, it will be gone forever. The water Laura is protecting is the basis of life on our planet. Animals and plants all need water to live. They need water to support their habitats and for drinking. When this water is not clean, plants change beyond recognition or simply die, and animals leave to find cleaner water sources. If the animals can’t leave, they mutate or carry poisons in their bodies that affect others higher up on the food chain, including us. As pollution continues to affect our waters, we have to become more careful about the foods that we eat, especially fish. We need to add more and more chemicals to our water to make sure it is drinkable. Finally, when the water becomes too polluted to drink, we need to bring water in from other parts of the country, which creates its own toll on the environment. So, based on the Traditional Knowledge of these women, what can we do to protect our waters? We can walk for them, we can pray for them, we can lay down tobacco for them, we can raise our voices for them. This should be our goal this Earth Day, and every day.